I can't believe how the time flies by. 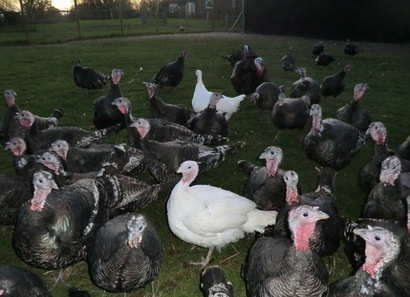 The turkeys arrived in early June and are growing well and look striking in the sunshine with their beautiful bronze feathers. They are happy roaming around in the paddock in the day time and have been really enjoying chasing the crane flies over the last few weeks. We had an enormous amount of 'daddy longlegs' this year and they are incredibly annoying when they come in the house whilst you are trying to cook dinner! Autumn is upon us now and we have had the fire burning a few evenings which Hope (our lab) really loves. She is pretty well fully grown now but is still quite small for a labrador and like a puppy in her personality.